Floor Plan is a simple, cartoon-like puzzle game that feels like a point-and-click adventure adapted into VR. 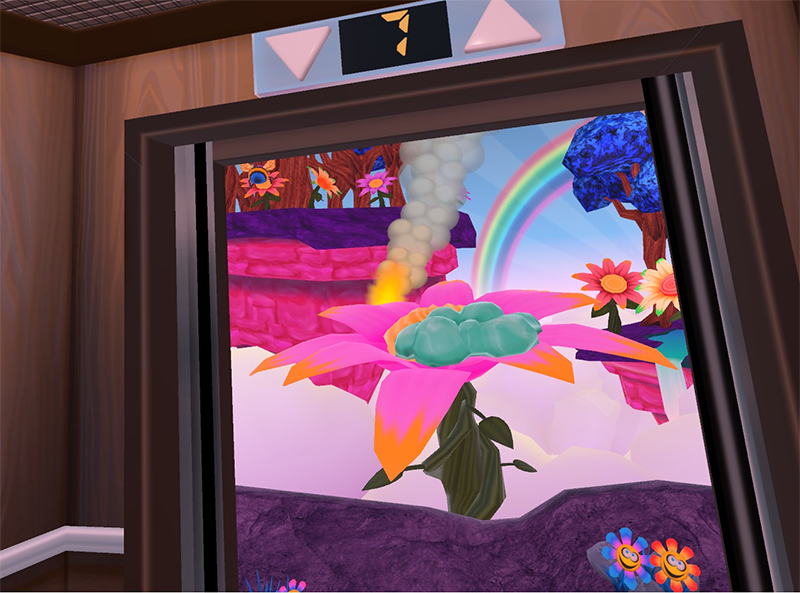 This game takes place entirely in an elevator, in which the player must travel between a dozen floors to piece together an astronaut suit. This cutesy title is very simple and its value is limited, but gave me a fun and unique experience that I don’t regret having. An entire game based in an elevator sounds boring, but Floor Plan presents a unique challenge. Each floor contains different zany characters or comically-misplaced environments that can help you achieve your goal. Some characters are willing to help you out, while others require a little…convincing. Since there are only 12 floors, I shouldn’t spoil any details, but this is essentially all there is to know about Floor Plan. It’s hard to imagine where this building is located! Despite being an incredibly simple game, the puzzles you encounter can be very challenging. Beating one floor usually provides an item that can be used to beat another floor, in a non-linear sequence. Some items have uses in levels that you already beat, keeping every puzzle relevant until the very end. The design choices in these puzzles are obscure and unrealistic, yet make perfect sense- making each puzzle fair, but deliberately confusing. There’s a button in the elevator that gives a limited number of hints for each puzzle, and these are surprisingly well-done. They always pointed me in the right direction, but never gave away the solution entirely. Floor Plan is given no context. You’re simply riding an elevator, trying to fashion a space suit. Given the game’s simplicity and trippy design choices, this lack of any story feels fitting. The game runs smoothly with a charmingly cartoony graphical style and is simple enough for anyone to play. The characters in Floor Plan, such as an anthropomorphized gumball dispenser or a robot cowboy, feel random and silly enough that I’d expect to see them running a children’s TV show. Because of this, and the game’s simplicity, Floor Plan feels like it was designed with a kid-friendly experience in mind. 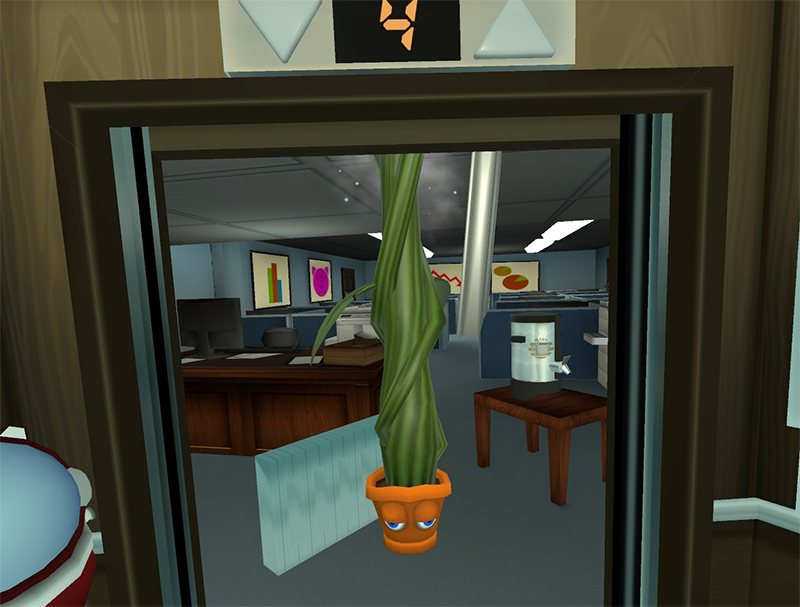 Who knew a conspicuously placed, alien plant with a face would be so helpful? The game’s sequence of events feels bizarre, but consistent. Floor Plan seems to invent its own clichés, blending together and providing a thoughtful, original, puzzle game. Unfortunately, this doesn’t last very long. The game took me around 45 minutes to complete, which isn’t bad considering its meager price point. While the game’s overall number of puzzles is satisfying, however, they have no replay value whatsoever. The solutions are the same every time, and the way characters behave become predictable after a single playthrough. This is inevitable for a game such as this, but you shouldn’t expect to play Floor Plan more than once. What would I pay for it? Floor Plan is a short-but-sweet, adorable puzzle game that’s a lot of fun, but only once. It provides a unique style reminiscent of point-and-click adventures, but in VR. With a cool 45 minutes of challenging gameplay, I’d pay $5 for Floor Plan. Priced at a still-modest $6, this is still worth playing for anyone interested in the game. 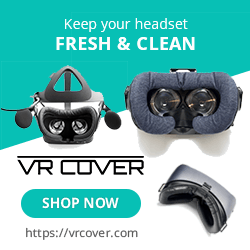 Turbo Button provided The VR Grid with a review code for this game and, regardless of this review, we thank them for that!